Learn how to create a new redirect and navigate your URL redirects tool. To update URL redirects in bulk, learn about uploading URL redirects or adding a flexible pattern URL redirect. In the upper right, click Add URL redirect to create a new redirect. In the right panel, select the Standard or Flexible redirect type. A standard mapping redirects one URL to another. Learn more about flexible redirects. In the Original URL field, enter the URL of the page you want to redirect. In the Redirect to field, enter the URL of the page where you want the original URL to redirect. When redirecting to an external page that's not hosted in HubSpot, be sure to use the full URL including http or https (e.g. http://www.domain.com/name-of-page). Please note: HubSpot automatically encodes URLs with special characters. For example, the tool will automatically convert é into %C3%A9 when it's added. Click More options to customize your redirect or add a note. Permanent (301): select this type to permanently redirect one HubSpot page to another URL. New URL redirects will be permanent 301 redirects unless these options are customized. Temporary (302): select this type to temporarily redirect one HubSpot page to another URL. This redirect type is often used when a website's undergoing a redesign, and traffic from a certain page needs to be temporarily redirected. Proxy: select this type to redirect the content of your live page without changing the URL displayed on the visitor's web browser. This redirect type is often used to share a file that's hosted on a specific directory outside your main site. Priority: set additional rules for how your redirect is applied. If more than one redirect exists for a URL, the redirect with the priority closest to 1 will be applied. The Assign the lowest priority checkbox is selected by default so that your redirects are applied in the same order they were created. To customize this setting, clear this checkbox and enter a custom value in the field below. Match query strings: select this checkbox to only redirect the page from the exact original URL entered. This option is not selected by default. Ignore trailing slash: select this checkbox to apply your redirect whether the original URL includes a forward slash at the end or not. This option is selected by default. Ignore protocol (HTTP or HTTPS): select this checkbox to apply your redirect whether the original URL starts with http or https. This option is selected by default. Disable redirect if a page exists at the redirected URL: select this checkbox if you only want the page to redirect. This option is not selected by default. Note: add some context about why this URL redirect was added. After you've customized your redirect options, click Add URL redirect . Please note: you can hover over the information icon info to see more details about each of these settings in your URL redirects tool. To edit, delete, or change the priority of an existing URL redirect, click the Actions dropdown menu and select Edit. Make any changes to your redirect options, then click Update URL redirect. Use the All URL redirects dropdown menu to filter your redirects based on how they were created. URL redirects added in the URL redirects tool are labeled as manually in the URL redirects tool. Any page URL you've edited in the Settings tab of the content editor will be labeled as System redirects. Use the All users dropdown menu to filter URL redirects based on the specific user who created them. Use the search bar to look up a specific URL that's redirected to a new destination, or a URL you've redirected to. Click Export to download all your URL redirects in CSV file. 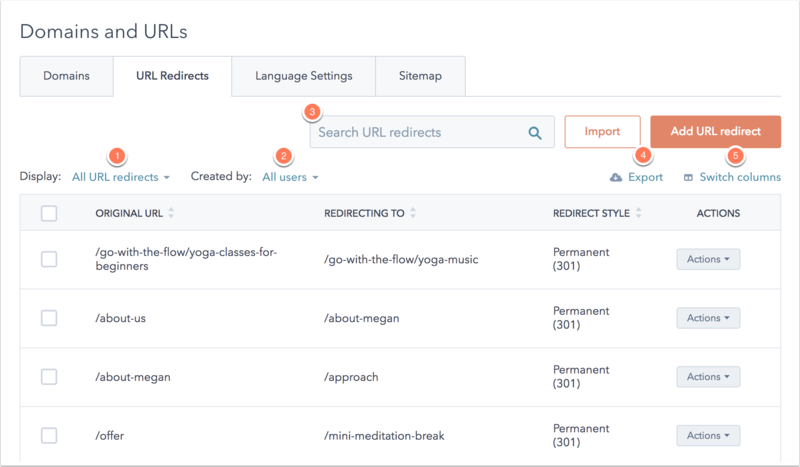 Click Switch columns to customize the fields that appear in your URL redirects dashboard. Click the X next to a field to remove it from your dashboard, and select the checkbox(es) next to the fields you want to display.